Sure, the iPhone can not cope with the image quality of a good digital camera … but it’s great for snapshots and ShakeItPhoto- or Hipstamatic-experiments. That’s why I’m collecting a lot of pictures on my iPhone from time to time. Sometimes I sync the pictures with iPhoto. But I’m not always using the delete-after-import feature. The current version of iPhoto does not have any problems with that if you use the “Hide Photos Already Imported” option: iPhoto just ignores the old photos and only downloads the previews of the new ones in the import section. But there is no way to delete all or a selection of these old photos in iPhoto, iTunes or on the iPhone. But the only solution to delete these photos one-by-one on the iPhone is not working with hundrets of photos. So, what to do? Connect your iPhone via USB with your Mac. If iTunes or iPhoto starts, wait for the sync, and press the iPhone-disconnect button within the itunes window. Make sure, that you quit iTunes and iPhoto. Open “Image Capture” from the applications folder. Select your iPhone in the left column and a list of the iPhone photos will be displayed on the right. 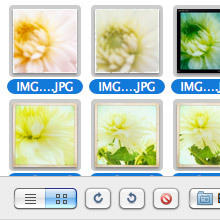 Select the photos, you want to delete – or select all pictures by pressing command-A. Now press on the red delete button just beneath the list. If you’re sure, that you want to delete the pictures you can confirm the deletion. WARNING: You cannot recover the deleted photos – so be sure, that you imported them to iPhoto before! i’ve search all over for how to delete selected pics from iphone, but ended on post how to delete all or one by one. Some forums even said that you can’t. ps. i wish i wouldnt have to browse thru google pages to find this article.